Oxford's Ashmolean Museum presented the 'Storms, War & Shipwrecks' exhibition from June to September 2016. 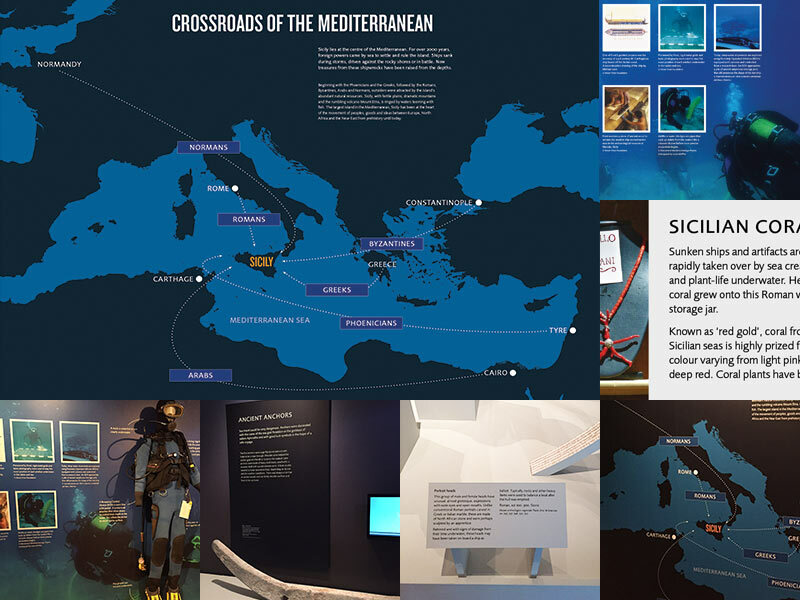 It told "the extraordinary story of the island at the crossroads of the Mediterranean through spectacular finds rescued from the sea by underwater archaeologists". I worked closely with the Ashmolean exhibition design team, and with the exhibition's curator and organisers, on a large amount of the signage, graphics and large format panels that carried information throughout the three-room exhibition. These pieces needed to stay within the Ashmolean brand while carrying a look and feel unique to the exhibition, and working in harmony with the colouring, lighting and objects within each room. Across a series of labels, panels, graphics and designs, a huge amount of information was presented in a clear, consistent and easy-to-understand way. This included several 'family-friendly' activities and elements, with multi-layered content designed to appeal across a wide age range. The exhibition was very warmly received and gained many plaudits, being described as "stunning" by The Times, and including feedback from visitors such as "excellent design and content", "beautifully displayed" and "fabulous".